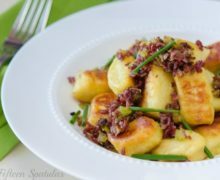 Potato gnocchi is pan-fried until crispy, and tossed with a pastrami ragu and fresh snipped chives. It’s a delicious meal to make for a special dinner! Let’s be honest here. Gnocchi is kind of a pain to make. It’s not really difficult or anything, but there are a lot of steps that make me feel like I need to block out several hours to make it. Now why on earth would I tell you that gnocchi is a pain??? 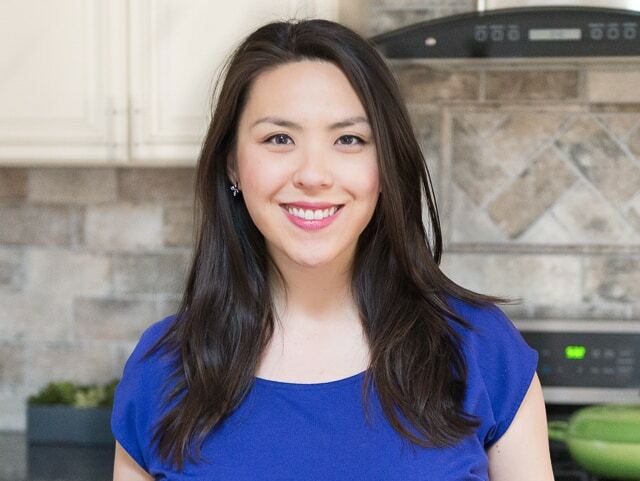 I want you to make these recipes, right? It’s because I know you will look at this picture and make it anyway. Or at least, that’s what seems to happen to me anytime I come across a photo of gnocchi on the internet. That’s it for me. Off to the kitchen to make gnocchi. My body is a slave to my stomach and my eyes, once again. The marriage of potatoes and pasta, and biting into these crispy edged fluffy little pillows…I feel truly comforted. Some people get that from mac and cheese. Me? Not so much. I get that warm cozy feeling from gnocchi. And this gnocchi recipe is definitely my new favorite. To put it all together, boil the gnocchi until they float, then dry them off with a towel. Pan fry them in a little butter or olive oil until golden brown and crispy, then toss with the pastrami mixture. Top with some snipped chives, and eat! 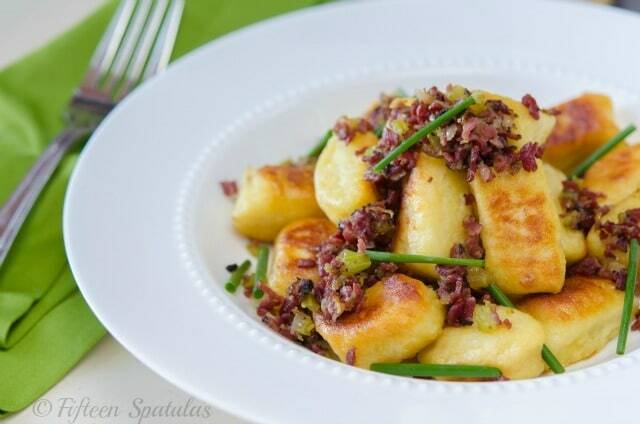 Potato gnocchi is pan-fried until crispy, and tossed with a pastrami ragu and fresh snipped chives. It's a delicious meal to make for a special dinner! 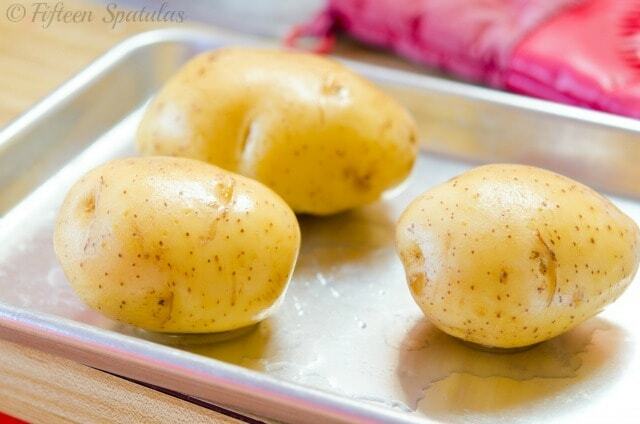 Preheat the oven to 400 degrees F. Poke the potatoes all over with a fork and place them on a baking sheet. Let them roast in the oven for about an hour until they are fork tender. Make sure to really put your fork all the way through and make sure they are done. Give them more time in the oven if they need it. Set up a food mill or ricer over a bowl and immediately press the potatoes while they are hot from the oven. (My food mill catches the skins, but if yours doesn’t, peel the skin before ricing the potatoes). Spread the riced potatoes all over a baking sheet and let them cool. 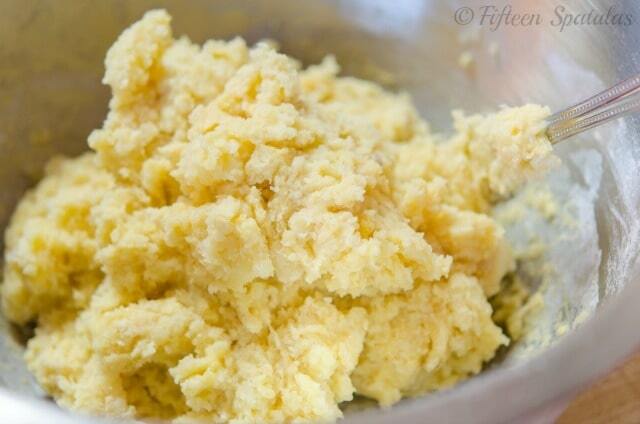 To make the gnocchi dough, mix the riced potatoes with the flour, eggs, and salt, and knead gently until it forms a dough. It will be quite sticky. 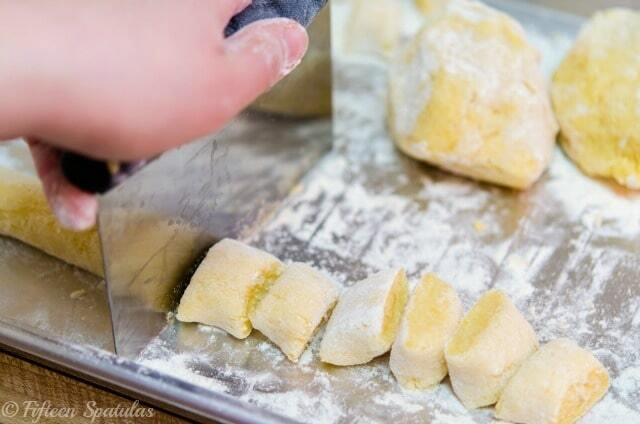 Divide the gnocchi dough into four even pieces. On a well floured surface, roll each gnocchi quarter into a long rope, then cut little pieces off with a knife or bench scraper. Spread the gnocchi out on a floured sheet pan and refrigerate for one hour. Bring a big pot of water to a boil, and season it heavily with salt, just like you would a pasta water. Prepare an ice bath as well. Boil the gnocchi for a minute or two, and remove them as soon as they float to the surface.Let them cool off in the ice bath for 15 seconds, then remove them to dry on a towel, then transfer the gnocchi to a bowl and drizzle with the 1 tbsp olive oil. Repeat with the remaining gnocchi dough until it’s all cooked. 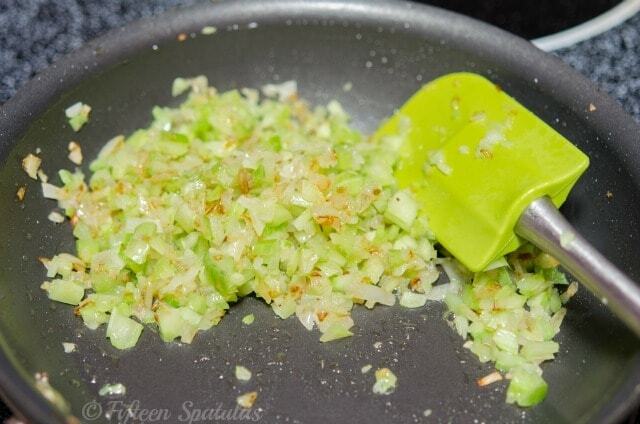 Heat up 2 tbsp of butter in a skillet over medium heat, and add the onion and celery. Cook for about 10-15 minutes until translucent and soft. Add the chopped pastrami and bump the heat up to medium high. Cook for 10 more minutes, until the pastrami starts to brown like bacon bits. Taste the mixture to season with salt and pepper to taste. Remove the contents from the pan. Heat the remaining 2 tbsp of butter over medium to medium high heat, and pan fry the gnocchi for a few minutes on each side, until richly browned. 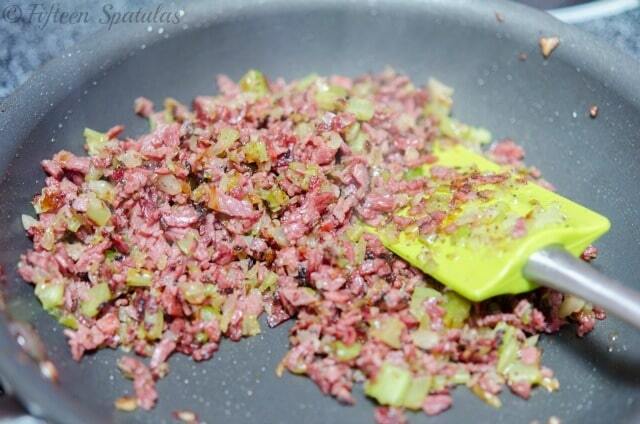 Serve with the pastrami mixture sprinkled on top, and garnish with chives. Enjoy! I tried these as per spec and they were great, however next time I would make a few changes. I would not chop the onion and celery as fine, perhaps use bacon or a honey ham chopped but am seriously thinking of putting a mild or medium cheese in the center of each one. The whole dish is time consuming so a few extra minutes makes little difference. One tip, these brown quite easily, if using a fairly hot pan, watch them closely. I use a heavy pan which holds heat well over a gas flame and at first the brown turned very very dark, reduced the heat, added a bit more oil, (I used a blend of butter and olive oil ) and things went well. Be sure to open a nice bottle of vino with this dish, the time put into it requires a reward! Hi Wayne, thank you for your comment. I loved hearing about the little tweaks that you plan to make. 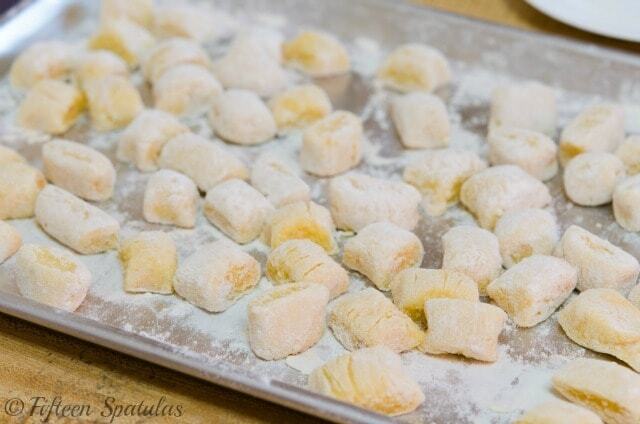 I agree, these are a labor of love, which is why I rarely make gnocchi, but oh is it good! 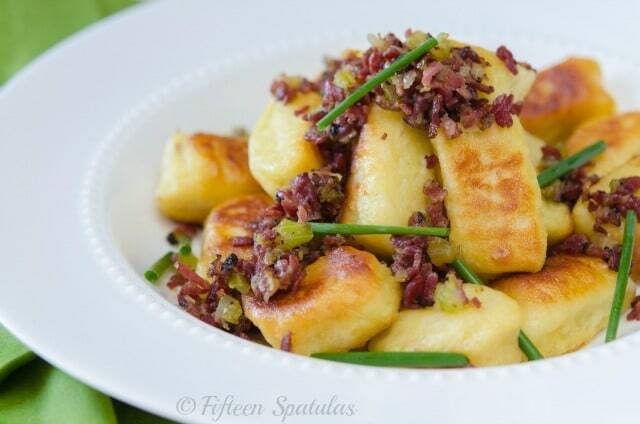 You had me at pan-fried gnocchi! I love making gnocchi so much. In fact I just make some from butternut squash today, I froze them for later. Love the topping you used here, so tasty and I bet the kitchen smelled delicious too. This sound like a plate of heavenly comfort food at it’s best! Just the thing for tomorrow night’s dinner!